These are the things we are never to forget. The love of Jesus, with its constraining power, is to be kept fresh in our memory. Christ has instituted this service that it may speak to our senses of the love of God that has been expressed in our behalf. There can be no union between our souls and God except through Christ. The union and love between brother and brother must be cemented and rendered eternal by the love of Jesus. And nothing less than the death of Christ could make His love efficacious for us. It is only because of His death that we can look with joy to His second coming. His sacrifice is the center of our hope. Upon this we must fix our faith." Happy Sabbath! Join me in welcoming Brandon Beck and the students of the WWU Wind Symphony to the platform. Thank you to all of our musicians for your hard work and dedication to the art of making music. Thank you for your generosity to the ministry of the University Church. Our mission is to teach all people how to follow Jesus. A core component of this involves empowering, inspiring, and teaching university students as they join God in His global work. At WWU Vespers in our Sanctuary Friday night, the Student Missions department dedicated outgoing student missionaries. Nearly 60 students from Walla Walla University will be traveling across the globe to serve in 2018–19. support our continuing partnership with the University and programs like Student Missions. 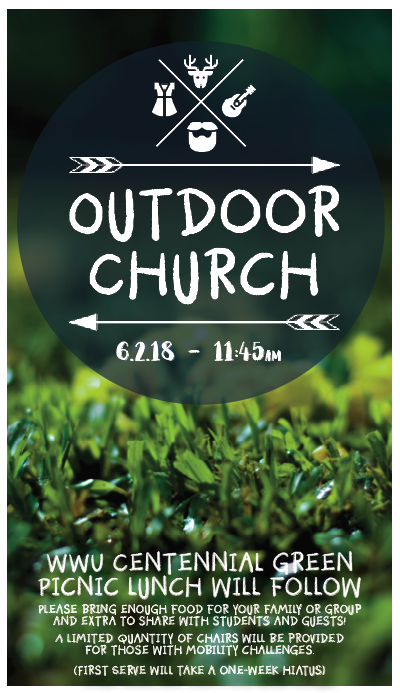 Please contact Brittni Bryan, WWU's assistant chaplain for missions (Brittni.Bryan@wallawalla.edu), to give directly to this invaluable outreach! Walla Walla Valley Academy Orchestra will be performing their concert, “Sonic Vistas from England and Italy,” at Village Church, Sabbath afternoon, May 19, at 4:30 pm. ASWWU invites you to a block party! Sunday, May 20, from 4–7pm on College Avenue. Dozens of vendors, booths, food, and fun from all over Walla Walla will be present. All are welcome! Wilbur Sylvester passed away. His memorial service will be Sunday, May 20 at the College Place Village Church at 3pm. 50-PLUS POTLUCK, Sunday, May 20, at 5pm in the Youth Center. Ray Sample will bring us a program of Christian music. Come and enjoy our last program until September 16. 4-7pm — ASWWU Block Party, College Ave.